An e-mail has just been sent to and she will have 48 hours to respond before another winner is chosen via random.org. Sping is coming and along with that is Easter, communions, weddings, graduation and so much more! If you are like me, you like to have the perfect party and using formal invitations is right up on the "must have" list. Using postcards is cost effective as it's cheaper to mail, friendlier for the environment and look great. If you are a business owner, who couldn't use some free promotional material to inform your customers of a sale or a special coming up? What about announcing something new? There are so many ways that FREE postcards can help promote your business. The fact that they are full color on both sides, provides free shipping with a three business day turnaround definitely catches my attention! When you choose UPrinting, you get to use their templates or design your own and you get a free proof. I've ordered too many times in the past to receive something I was completely disappointed in so this is an excellent feature to me. Recipe cards to give out or to keep yourself. Reminder notices to send your customers. School PTO/PTA notices and events. 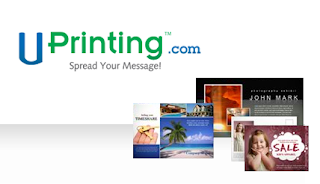 UPrinting is a one stop shop for all your printing needs whether you need postcard printing, promotional printing, flyers, labels, business cards, canvas prints, vinyl banners, catalogs and so much more. A great birthday can be planned through all the great products and a business can get all the promotional material they need! Follow my blog and tell me what you would use the postcards for if you won. Giveaway ends 3/17 at midnight and winner will be chosen by random.org. *Disclaimer: I did not receive compensation for this post. I follow your blog on GFC user id Aline and I would use the postcards for thank you notes. Hi! I just became a follower. I would use the postcards for part of our wedding invitations. I already follow uprinting on both twitter and facebook! I follow your blog. These would be good to use as thank you cards. Ahhhhh full color...Uprinting does a good job too - color was great on my square business cards! I follow you. I would love these for my son's first communion! I entered your allchildrensfurniture.com giveaway. I follow UPrinting on twitter! I would use the postcards for my Christmas cards this year - save a little on the postage!